This is the (bereft of actual notes) battle report of a 2v2 game at the club’s Saturday Open Gaming. On Thursday, my wife and I popped over to the shop for a day of games. After the somewhat grim tidings earlier in the week, we wanted to till the community soil, so to speak. We’d planned to play a one-on-one game (her first) but a couple of friends were just starting up their own game with relatively slim forces, and they invited us to join them. * They ultimately decided to bust back down to their respective battlegroups, though we discussed just adding Stacey’s and my forces each to a table side (our points break out at the same, so that would have balanced things too). On one side of the table, we had my wife playing The Retribution of Scyrah (Elven xenophobes with quick, relatively low-damage Warjacks who enjoy a unique forcefield system; the field is repairable for focus, meaning that with careful management these guys are insanely durable. She made excellent use of the Chimera’s teleportation and Arc Node abilities to throw some magic death into the back ranks) and Danny following up his last administered beating with the return of his Khador forces (Honkin’-high armor, brutal close-combat, and that icy-gaze-having Warcaster). The Hordes side of the table featured me with my gator boys and my partner with the Legion of Everblight force (which I’ve talked about before). Having the Shredders on the board gave us a slight model advantage, and my two heavies helped Hordes tie the Warmachiners in that regard. Having fewer light ‘Jacks meant that we’d be at a disadvantage in terms of durability, and be reliant on charges and perhaps ‘Caster assassination to succeed. We won the setup roll, and–I think quite by accident–got counter-deployed. My higher-strength, high-Arm forces really wanted to stomp on Stacey’s comparatively fragile ‘Jacks. Parasite would equalize Khador armor values, though the Carnivean would be hard-pressed against a pair of heavies. The Legion’s little missiles could, at the least, outmaneuver the heavier Khador figures to get at the juicy fur-hatted lass behind them. I pushed my gators toward the middle, dropping puddles to chill in (which continues to cause me some challenges with advancing Barnabas, though I’m going to try and start taking advantage of the fact that even in a Swamp Pit my Warbeasts still block LoS to my boy) and relying on the readily-available Pathfinder in the Legion to complete the criss-cross motion. My partner mostly moved directly towards the Elven forces, spreading some defensive animi around and setting all his Shredders on Rabid (boosted attack, damage, and speed, plus Pathfinder) to spread them out a bit. Mostly positioning on the Warmachine front, with Stacey throwing a covering fire AoE out from her Manticore and putting a bit of spread to her forces. Danny pushed forward pretty aggressively, using his Focus to shove his ‘Jacks into my face since he couldn’t shoot. I squeezed a few more inches out of my ‘Beasts, but as I’d completely neglected to Rile anything on the previous turn, my fury pot was empty. I slashed on Barnabas enough to get both a Swamp Pit and Iron Flesh out, but ended up leaving the gator-caster exposed. Our Legion forces pushed ahead in a tight formation (which would prove unfortunate when the hard AoEs started to fall). The Ironback Spitter threw some gnarly phlegm, boosting heavily and spreading some corrosion to the Khador forces. I riled my warbeasts such that I’d have a full plate on my next turn–it’s how the game should be played. The Carnivean managed to blast a multi-target Dragon Breath, laying a few pips of damage here and there. Things popped off this turn, with Stacey using her Feat to render the Ret forces immune to charges (stealth wasn’t helpful for dealing with the Legion, and as you may have noted my side did not execute on Battle Plan Alpha). With Wind Rush, Danny was able to shove Sorscha forward and position her in such a way as to freeze the majority of both forces on the Hordes side. My Wrastler managed to be just evade the range of the effect, though both ‘Beasts ate hits from the Pathfinder-ed charge of the Khador jacks. I had an awesome plan for my turn, one that I actually forgot in the midst of all my rolling. I threw down a puddle directly behind the Juggernaut engaging my Wrastler, and moved my Spitter to engage Danny’s Destroyer. I also brought Barnabas up to Feat (knocking everything in 12″ down) and swing with his Reach axe. This caused some activation issues with the non-Amphibious Legion, and we all learned a bit about the timing of forcing a ‘Beast to stand…he was able to shake off the frozen effect on his army, but wouldn’t have the option of doing the same after Barnabas dropped the bomb. We tried getting maximal use out of his models against the Retribution (who were going to be outside of my Feat range anyway), but not being able to charge them limited my partner’s options. Things were close enough that some swings were still exchanged. A lot of fury was expended thawing all the beasties, and one bold Shredder took a Hail Mary charge at Sorscha that would have been awesome, had it connected. 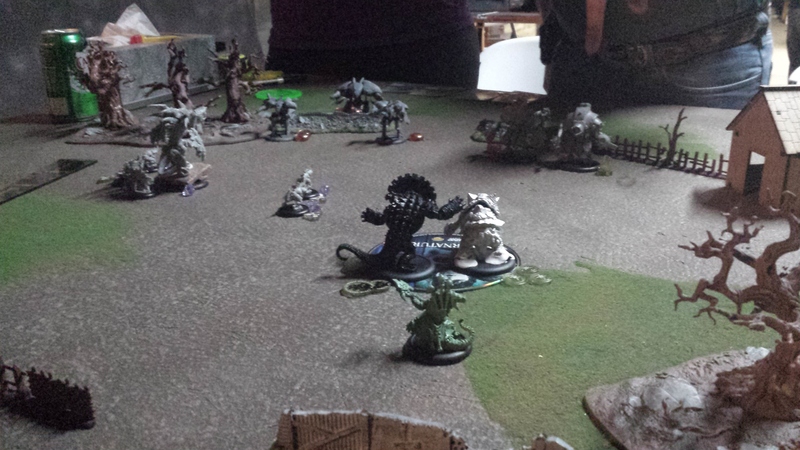 What happened instead of that, though, was that Stacey’s Griffon cut the Shredder in half with a halberd free strike. Stacey’s rolls would otherwise run cold until (foreshadowing) they really mattered. The Wrastler took a bucket of swings at the Juggernaut, buying and boosting a couple more bites for decent damage to the tough ‘Jack. 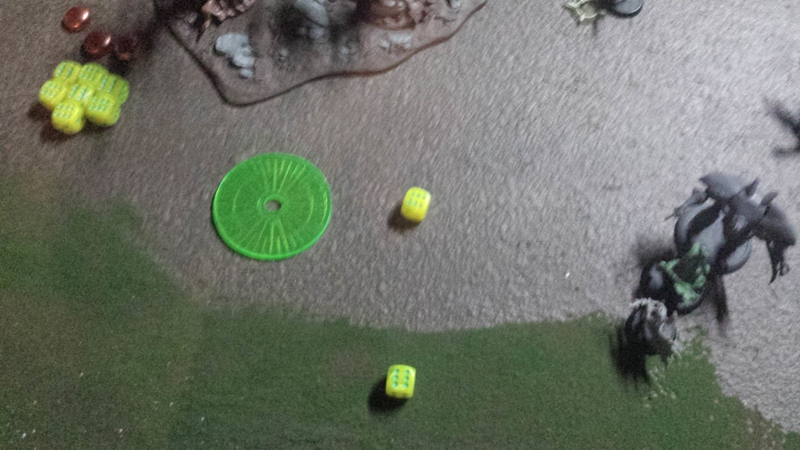 My turtle hoisted the Destroyer and threw it into Sorscha, rolling poorly for the collateral damage and activating his Animus on for the counterattack. What I meant to do was position my Spitter so I could throw the Destroyer into the back of the Juggernaut; even with deviation that should have landed him in the water, and thus inert. I got greedy when I realized Sorscha was in range, with visions of crippling the ‘Caster dancing in my head. Legion forces continued to chew on Ret ‘Jacks, while my partner fled with his wounded Lylyth. The Retribution ‘Jacks closed in and got to cutting, carving their way through the Carnivean and the remaining Shredders; I believe Stacey popped one with a lucky pistol shot from Kaelyssa and learned how awesome it was to drink the fury of her foes thanks to Energy Siphon. Khador stood up, primarily, though even more damage was layered onto my Wrastler and Spitter (the latter of whom died either this turn or the next one). Things get a mite hazy because it was around here that my partner quit. His ‘Beasts had all been wiped, but Lylyth was still sitting on almost full health…he’d fled with her to the very limits of her control radius. His leaving deprived me of a pretty key ranged force (even with cutting for fury) and I prepared to jump into my turn without it…then realized that we have the Legion Battlegroup. A quick sub of my Lylyth for where his had been, and we were on to the next round! Lylyth cut for maximal fury, shooting the Chimera, laying Parasite on it, then shooting it a few more times. She managed to chip away some key systems (notably wrecking the generator and thus Stacey’s option to use it as an Arc Node), providing some resistance on my left flank, before Buswhack moving out of charge range. 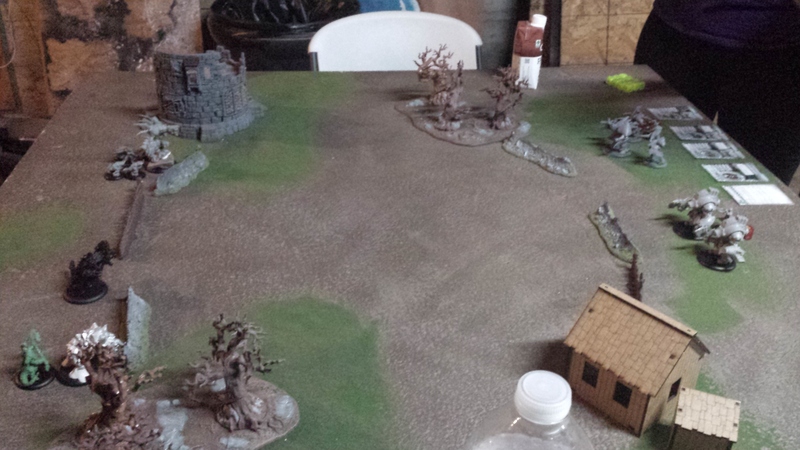 The Spitter, badly wounded by the Destroyer counter-attack, managed to chuck him into a puddle; my Wrastler and Barnabas cut through the Juggernaut. Things were now down to a lightly-damaged full Retribution force and Sorscha versus my heavily-injured ‘Beasts, a mostly-full Barnabas, and Lylyth. Blurry, but the key thing here is that crit, with which Stacey shot Barnabas out of that melee. It was awesome to lose to my wife, as it always is. Danny and she have had a standing agreement that the first game she played against someone other than me was with him, and he graciously allowed a team-up to count for that. He was patient and eager to help, and Stacey remained unflustered in the face of that help, plus my help, plus the help of people just wandering by<&mdash>a lot of folks were happy to offer assistance, is what I’m saying. That was compounded by Danny and I also being new to the game, so as always we sought the wisdom of the store manager (himself playing in a considerably larger 2v2 game). It was great to see the basement full of games; there was even some Warhammer going on in the back, despite the sudden surge in Privateer Press affection. I learned that I probably play Barnabas too defensively in the early game, which means that my heavies lack some of the critical melee support they require to drop Khador ‘Jacks in particular. I also didn’t see much return from Iron Flesh this game, owing to Sorscha’s feat, but this meant I undervalued it after her feat turn, when it would have proven much more useful (as I saw in the next game my wife and I played). *In the final accounting, my partner’s reluctance to play a training game–despite being new to the game himself and thoroughly incensed with his first demo was a quick, competitive affair–means he probably shouldn’t have invited us to play. Or just stepped out and let me rock a 1v2, since that’s how the game ultimately played out anyway. Posted in Battle Report, Hordes, Warmachine.Tagged Battle Report, Blindwater Congregation, Hordes, Journeyman League, Khador, Legion of Everblight, Retribution of Scyrah, Warmachine.